While garages are mainly meant for cars, they often become overgrown with junk. Turn your unused space into a place for your family to enjoy. 1: Expanded kitchen. If your kitchen is currently next to your garage, consider expanding your kitchen and dining area size. Large kitchens are the perfect place to entertain your friends and family. An expanded kitchen is perfect if you currently have a single car garage and would like a little more space for entertaining. We love this example of a kitchen and breakfast area addition on Houzz. Click here to see the before and after pictures. 2: In-law suite. An estimated 60.6 million Americans now live in multi-generational homes, defined as “a household with two or more adult generations,” and it shows no signs of slowing down. There are many reasons for a household to turn into a multi-generational home. With a large number of baby boomers that are financially able to include their parents or adult children in their homes, it allows for families to strengthen relationships with one another while living under the same roof. For many, it gives a “peace of mind” knowing that they can see their parents or children at home. 3: Home office. With the increase in the number of telecommuter jobs, it is now more vital for families to have a designated home office area. 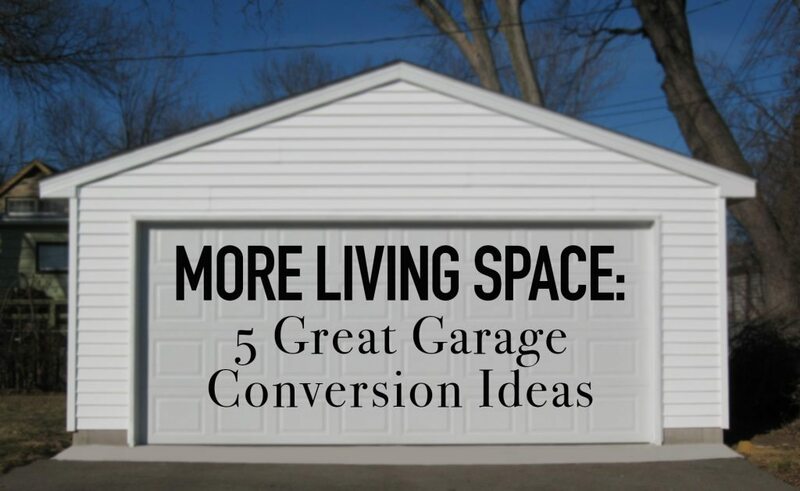 A garage to home office conversion may be beneficial if you are often distracted by things around the house. It adds a much needed privacy to get work done. By having a home office separate from the rest of the home, it will allow for workers to be able to concentrate more on their work and have to experience less distractions. Plus, Bank Rate claims that 44% of buyers would pay an extra $1,920 to pay for a home that already includes a home office. 4: Game room or playroom. A converted garage space can mean more room for your family to get together and “hang out.” The extra square footage could be perfect for a family with smaller children, or serve as a hang out or homework area for older kids. This type of conversion is perfect for adding built-ins for extra storage and for hiding the kids’ games and toys. 5: First floor master suite. If you plan on staying in your home for as long as possible, it may be a good idea to introduce the possibility of a first floor master suite. Having a first floor master becomes more and more convenient as you age. In addition to convenience, first floor master suites are often separated from kids’ rooms-which adds an element of privacy. Even if you want to stay close to your kids upstairs for a while, the downstairs suite can be used as a guest bedroom. This garage conversion would be convenient for years to come. Wow to much space for expansion.. Thanks for sharing your post. These are awesome tips (awesome images as well!) Some of my clients ask me ideas too when I resurface their garage floors, or basically do any decorative concrete work. I get a lot of ideas but these are actually good ones that could play well to my current clientelle! Thank you so much for this!